Wash the vehicle regularly. Wash more frequently when driving in the following conditions: • If driving on roads with road salt. • If driving in coastal areas. • If tar, soot, bird droppings, insects, or tree sap are stuck to painted surfaces. Fold in the door mirrors. Make sure to follow the instructions indicated on the automated vehicle wash.
• Keep sufficient distance between the cleaning nozzle and the vehicle body. • Take particular care around the windows. Standing too close may cause water to enter the vehicle interior. Do not spray water into the engine compartment. 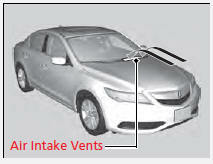 Wires are mounted to the inside of the rear window. Wipe along the same direction as the wires with a soft cloth so as not to damage them. Aluminum is susceptible to deterioration caused by salt and other road contaminants. Use a sponge and mild detergent to wipe away promptly. Be careful not to use harsh chemicals (including some commercial wheel cleaners) or a stiff brush. They can damage the clear coat of the aluminum alloy wheels that helps keep the aluminum from corroding and tarnishing.